_ Cashmere goats have been bred and used in Central Asia for hundred of years. The cashmere is the extremely fine, soft under down these goats grow, and it is highly prized for the making of incredibly soft, light and warm garments. Europeans "discovered" the fibre, notably in the so called Ring Shawl. These soft, warm shawls were so fine they could be pulled through a wedding ring, hence the name. Some reports have the Western world's demand for this fibre beginning when Napoleon brought back a ring shawl for his wife, Josephine. Regardless of when the craze began, cashmere remains the ultimate in luxury fibre. In the 1970s, scientists in Australia started breeding feral goats for cashmere production. The project was quite successful, and other countries took note. 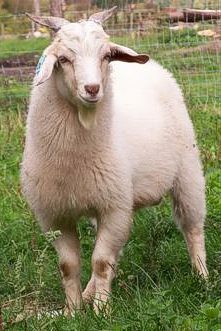 Scotland and the United States also started breeding cashmere producing goats in the 1980s, using genetics from Australia, New Zealand, Tasmania, as well as other regions. In the US the feral Spanish meat goats were used in the breeding program, after careful selection for fibre traits. There are variations in the appearance of the Cashmere herds in different countries, as they each have their own unique genetic make-up. However, they all share the ability to grow significant volumes of the very fine, crimpy, soft underdown. Farmers in Canada started our herds in the late '80s and early '90s using genetics from Australia and the US. _ Cashmere comes from a GOAT??!!!" Time and again breeders have heard this statement expressing such surprise. Yes, the exalted luxury fibre classed as cashmere comes from the modest, unassuming little goat. The fibre is so extraordinary, one expects that it should come from some wild, exotic creature, rarely seen by human eyes. Most goats, other than Angoras, produce an underdown. If the fibre is long enough and fine enough it can be classed as cashmere. 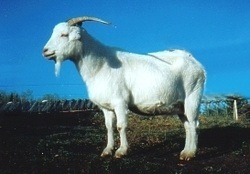 Cashmere goats are goats which have been specifically bred for the cashmere fibre. The amount and quality of the fibre is vastly superior than in goats not specifically bred for cashmere fibre production. Angora goats produce mohair, but will not produce cashmere. What is noticeable in Cashmere goats is the diversity of appearance. There are similarities too: they tend to have wide horns, blocky builds, and refined features. However, they come in all different colours, which makes a herd of Cashmeres appear like quite an assortment. White tends to be dominant, but black, brown, red, cream, grey, and badger faced are very common. They also may have either long or short guard hair. What matters is not the colour or length of the guard hair, but the quality and quantity of the down underneath, and the size or build of the animal. Cashmeres are judged 50% on fibre and 50% on body. A large animal produces more fibre and more meat. Cashmeres are generally raised as a dual purpose animal; for fibre and chevon (goat meat). Producing two commercial crops instead of one adds to their attraction as a productive and sustainable agricultural animal. Cashmere goats tend to be alert and wary, rather than docile and placid. These traits are largely due to their feral ancestry, relatively only a few generations back. They also tend to be very easy kidders and good moms. Cashmere is a very specific fibre, rather than the name of the animal it comes from . This is unique in the animal fibre community and is, in part , what makes cashmere the fibre that other fibres are so frequently compared to; as in: "As soft as cashmere". To be classed as cashmere the fibre has to meet certain criteria set by the industry. These standards vary somewhat from country to country but in general the fibre must be finer than 19.5 µ, longer than 1.25", have crimp, and low lustre. So although many goats might have a down, it might not be something that could be classed as cashmere. Cashmere comes in a variety of colours from pure white to cream to soft greys and browns. 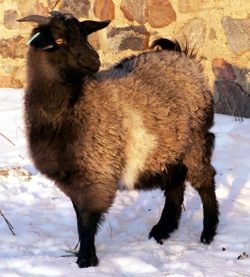 A black goat (black guard hair) would produce a soft grey or brown cashmere. To assess a cashmere fleece, breeders will often have a laboratory do a "histogram" This is a measurement of the mean fibre diameter of thousands of fibres from the animal. This, along with a fleece grading from someone experienced in cashmere classification, are tools used in breeding programs to develop and maintain a herd of Cashmere goats. Cashmere is an extremely valuable fibre. It is very light in weight, and each goat only produces a few ounces a year. Because of its value, there is a real concern with products being sold as cashmere, when they are not. The demand for cashmere continues to grow globally, which adds to its value and the problem with mislabeled products. Wool and other fibres are frequently blended with the cashmere, and sold as 100% cashmere. The marketing term "Pashmina" is often confused with cashmere. Pashmina is not a legal fibre term for labeling purposes, but instead is an Indian word used to describe cashmere in India and Nepal. Often items sold as "Pashmina" are a blend of silk and cashmere, however there is no guarantee or requirement that they have any cashmere in them. "Buyer Beware" is good advise for those investing in a cashmere garment or yarns. For more information on what to be aware of regarding fraud and the mislabeling of cashmere, check out the web page of the Cashmere and Camel Hair Manufacturers Institute (CCMI). _ Goat meat is regularly enjoyed in most regions of the world: the Mediterranean, Caribbean, Middle East, Latin America, and Asia. The demand for goat meat continually increases in Canada to the point where we import over 3.5 million pounds a year. The Cashmere goats, with their Spanish meat goat ancestry, perform well as a meat goat. The strengths they bring are their fertility, easy kidding, good mothering and fast rate of gain. They are often used in commercial meat goat operations for just these reasons. The dual purpose nature of these animals allow the producer to raise Cashmeres commercially, profitably. The demand for meat also allows Canadian producers to keep the quality of their cashmere high: it provides a solid market for animals with inferior fleeces.